One of the most impressive pictures of mysterious beings realized a few days ago ...! 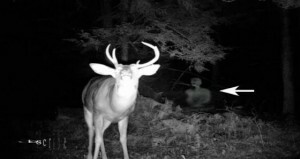 A mysterious creature, quotes alb-observer.com, appeared mysteriously as a photographer was filming a deer in the pasture, and this being like and look at the pictures appeared at her side. Photography was carried out in the national park in Allegany in northwestern n Kinzua. But what can this be human?